We have now completed two-thirds of the school year using BJU Heritage Studies 5 as part of Amber's social studies / history curriculum. It has definitely fulfilled the role we intended for the BJU curriculum. However, we use it less and less as the year continues and I have to admit we are even a little bored with it. We might be just a somewhat worn out from school in general, but the excitement has been lost from this curriculum lately. 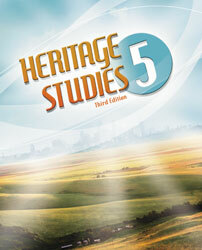 BJU Heritage Studies is a standard style social studies curriculum that includes more than only history facts. Map skills, geography, budgeting, economics, and even political systems are all taught in conjunction with related times in history. This aspect is especially helpful to the students when otherwise pivotal points in history might be diminished without an understanding of the underlying factors. There are periods in history that BJU Heritage Studies 5 glosses over rather quickly or entirely skips in favor of more social studies type topics. I was especially disappointed by the amount of time devoted to World War I, and thus supplemented it quite a bit with our other history curriculum (AO Lifepac), books from Heritage History, Netflix videos, and my own personal knowledge from history studies. However, in a single year curriculum there is not time to cover all facets of every historical event while providing those extra topics that make this a full social studies curriculum. To tailor the curriculum to our needs, we did choose to supplement the BJU Heritage Studies quite a bit. I also must confess that we have left out whole chapters on topics Amber has already covered in depth within the last two years. We prioritized the topics a little differently than BJU in order to make time for more detailed studies of interesting events. The BJU Heritage Studies also provides many ideas for projects to do with your students. Unfortunately, some of the projects expect you to have more than one student. This seems odd in a homeschool curriculum geared for one specific grade. We never found any of the project suggestions to be of interest and have done our own ideas. However we are somewhat limited in our project scopes by having only one child, who on top of everything else is not terribly interested in art projects. The full curriculum set includes an activity manual for the student that helps to reinforce the lessons and encourage thought. We do use the activity manual for most lessons, but some of the pages are entirely religious based. There will be a whole page based on Bible verses from a translation we don't have in our house. We skip those activity manual pages every time. We have a specific subject for religion study and choose not to include the religious only pages of Heritage Studies. We don't mind curriculum that is religious based, in fact I prefer curriculum with a religious world view. That said, sometimes the moralizing in this curriculum can be over the top. Additionally, the history of religious revivals and details on various missionaries are presented as part of the factual sections. While the information is factual, it really has little to do with the topic of the lesson excepting that it fits the time frame. I'm sure there are families who enjoy the evangelist interpretations in this curriculum. Our family is Lutheran and we are not interested in information about revivals or missionaries from the evangelist groups. Additionally, some of the religious inferences made in the curriculum are walking a fine line and come close to be contrary to Lutheran beliefs. This was my biggest disappointment with the curriculum. The curriculum set also has a very detailed, spiral bound teacher's guide that not only includes reproductions of the student text, but discussion questions with answers, project ideas, additional historical information for each lesson, and supplemental teaching tools. The quizzes (and answers), activity manual answer key, and more resources are all on the CD that comes with the teacher's guide. I would prefer the activity manual answer key to be a separate book so I don't have to use the computer for grading every day, but it does reduce the storage space and keep the costs lower. Overall, we have been pleased with the curriculum and would recommend it for others who want or need a social studies type curriculum for their children. If you are simply interested in history, I would strongly suggest using something simpler and supplementing it where necessary. Same feelings here. We tried BJU history a few times but just never could quite get through it all. I too think its actually a good basic history course but we ended up wanting to dig deeper into certain events or time periods. So we also supplemented a lot. That's the great thing about homeschooling though, you can try this and try that until you find what works for you and your child. It hasn't been perfect, but I know Amber's parochial school teachers supplemented their social studies curriculum quite a bit too. Amber is in middle school next year, so we are going in a different direction for those years. This was the last year of social studies.